Time for some catch up! 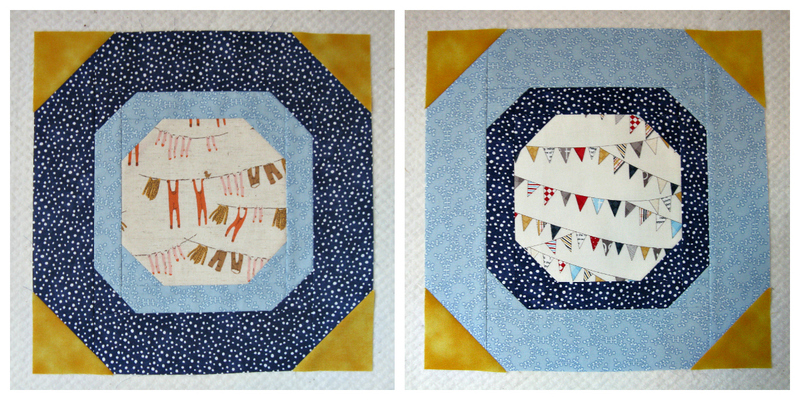 First off, this weekend I made this month's bee blocks for the Joy circle of do.Good Stitches. We were to make two double snowball blocks using blue rings with yellow outer corners, and a novelty print centre. Blue and yellow are colours I don't often use, especially blue. In fact, I went out and bought two FQs specifically to make these blocks because I couldn't find enough blue in my fabric bins. I have quite a bit of aqua, but not blue. I'll be looking forward to seeing how the quilt comes together. Remember these??? My lovely stack of Joel Dewberry's Notting Hill. My plan when purchasing these was to make a Supernova quilt, from 'Quilting Modern', but now I'm having second thoughts. I do love the Supernova, but it's the thought of making an entire quilt using 'stitch & flip' triangles that has me second guessing. It's the reason I stalled out on making a Sparkle Punch quilt earlier this winter, and also when making the above bee blocks which uses the same technique, I was glad that I only had to make two blocks! So now I have this beautiful stack of fabric with no concrete plan, but I'm dying to start using it! Might be time to start perusing my own Pinterest boards. And finally for today, this I Spy baby quilt I showed last week is now listed for sale in my Etsy shop. Your bee blocks look great! I have the same problem with having lots of aqua and not much blue. I made the Supernova quilt and liked it, but it is a bit of a project. A lot of the blocks in the quilt are just left as blocks and I don't think that part actually took that long. The thing that took much longer than I expected was trying to match my blocks to the layout in the book! I don't think my brain was working very well when I made that quilt because that part took forever. I'm the same way, tons of aqua but hardly any blue. I'm with ya with hardly any blue! Tons of aqua but no blue...I'd also be itching to dig into the Heirloom, so pretty!! Low your ispy, such a great baby quilt! Not much blue in my stash either. I think I go through stages with what I like and buy though, because I used to have lots. I detest stitch and flip, too! But I do love the Supernova quilts I've seen. Have fun making your decision! Oh I hope you find a use for those beauties! Lovely stuff! I know I've heard the term stitch and flip, but I don't know if I've done it, I can't think of what that means. I hope you find something cool to make using your notting hill. I'm not feeling very creative as of late! I'm the same with blue, which really surprised me, but I bought a little bundle to give me some choices. Lovely fabric stack, so hope you come up with a quilt plan - just beautiful!